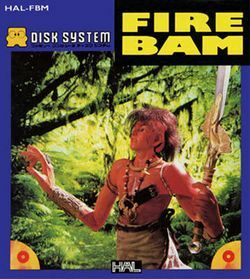 Fire Bam is an adventure game developed for the Famicom Disk System and published by HAL Laboratory in Japan on February 1, 1988. In the game, the title character must explore a world and "unfold" it into its full size by exploring towers and defeating boss characters inside. In addition to the starting equipment, five weapons, shields, and boots can be purchased or obtained to give the player a degree of customization. The game sends Bam into a forest where he has to defeat all sorts of monsters. Defeated enemies drop fire elements which can be collected and used as currency inside the shops scattered around the game. Special items and new weapons can be purchased this way. Bam will eventually discover tall towers, each one of which needs to be visited and the bosses hiding within defeated. Once a tower is completed, the area around the player expands to the left and right, creating new territory for the player to explore. In addition, new buildings and shops appear in the player's home territory as towers are completed. Fire Bam is most often compared to Zelda II: The Adventure of Link without the overworld map. However, several elements of the game hamper its playability. These include the speed at which the character moves with the default boots and the difficulty controlling him, the difficult jump performance which demands more speed to get more height, the dramatic increase in difficulty with later bosses, and the lack of ability to defend yourself from attacks. As with many Famicom Disk System titles, players may be met with long load times, especially when asked to frequently swap disk sides. The game tells the story of Bam, a fifteen years old courageous boy. Like every boy his age, Bam must pass the village's test and bring back an insect's shell from the forest. But as he returns, and to his surprise, most of the village has been destroyed and his parents turned into demons. Armed with his sword, Bam sets forth in search of what happened to the village and his parents. This page was last edited on 14 March 2012, at 00:56.